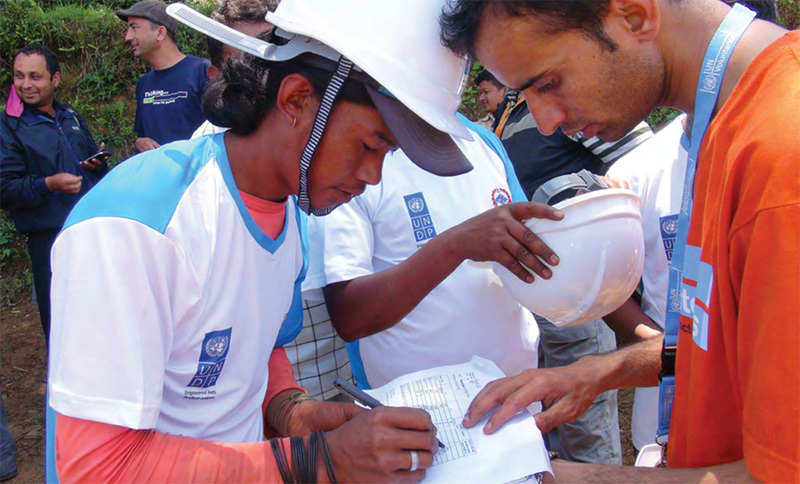 In the wake of the 2015 Nepal Earthquake, UNV partnered with the United Nations Development Programme (UNDP) to swiftly mobilize a total of 107 UN Volunteers who served in earthquake-affected sites to perform critical functions and deliver services to the victims. The earthquake, which hit Nepal on 25 April 2015 with multiple aftershocks, brought about widespread destruction across the country and resulted in 8,790 deaths, 22,300 injuries and 755,549 houses that were either damaged or completely destroyed. In coordination with UNDP experts on demolition, UN Volunteers undertook the structural assessment of public and private buildings damaged by the earthquake, including schools, health posts and monasteries. Working in tandem with local volunteers and coordinated with important local bodies, such as the Village Development Committee secretary and the Ward Citizen Forum, they made door-to-door visits to households to conduct the assessment and performed the day-to-day oversight and quality assurance of debris clearance operations undertaken by the brigades. They also supervised cash-for-work brigades comprised of people from the community which cleared vast quantities of debris scattered in the disaster-hit areas. These activities were important in ensuring that no further fatalities resulted from such debris and that a sound physical environment was quickly restored, paving the way for the reconstruction of houses and public buildings. Working with different stakeholders and the local community, the UN Volunteers assessed 4,060 earthquake-damaged structures and led the clearing of 294,279.18 cubic meters of debris both from houses and public structures.